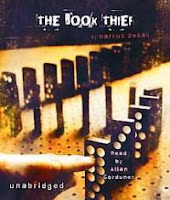 A Book Dork: "The Book Thief" Stole My Heart! "The Book Thief" Stole My Heart! “The Book Thief” by Marc Zusak takes place in Nazi Germany and is narrated by Death. He tells the tragic story of Leisel Meminger, a young German child, who is separated from her family when she is only 9 years old simply because her parents were thought to be Communists. Leisel is taken to live with a new family in the town of Molching, Germany where she eventually makes a home for herself. Even though Leisel eventually finds happiness in her new home, the political climate touches her life in many heartbreaking ways. “The Book Thief” is the best book I’ve ever listened to on audio. Allan Corduner does a fantastic job of portraying the emotions of the different characters. He has a wonderful accent and a beautiful tone to his voice that just carries you through the story. The book is 11 CDs long making it close to a 14-hour listen that I wish never had to end. I listen to audio books at the gym and in the car and this story made the time fly by. I was so excited to drive two or three hours just to be able to listen to a large chunk of the story. I could seriously gush about the book forever, but for now I must bring it to an end. I cannot think of one negative thing to say about this book. It is definitely one of my favorites. P.S. If you do listen to the audio book I would suggest at least browsing through the print version because there are some really great illustrations in it. It isn't necessary, but it just made me love the book a little more. I'm glad to hear that! I felt the same way then I first saw the length of the book. I was actually looking for an audio book to listen to in my car and someone I work with raved about The Book Thief audio. So many people had previously insisted that I read the book that I figured I might as well try it out. I'm so glad I did! I hope if you end up reading it that you love it as much as me. "Gamer Girl" is a winner! 2008 to 2009 Cybils Winners! Soon will get "Deeper" in the "Tunnels" series. School and pleasure reading is a bad combo!